This was my haul from the Orioles' game-used yard sale at FanFest. No regrets. Sorry about my untimely yearlong absence. Long story short, the site was hacked and redirected to a malware site last May, and through an unfortunate combination of procrastination, a lack of technical know-how, and being otherwise occupied with renovating and moving to a new house, I didn’t get around to setting things right until last week. The good news is that baseball is back and so is NumerOlogy! #2 J. J. Hardy: O’s new shortstop wore #7 in Milwaukee and #27 in Minnesota. #11 Robert Andino: Utility player cedes #12 to Mark Reynolds. #12 Mark Reynolds: Free-swinging third baseman wore #27 in Arizona. #13 Willie Randolph: Buck’s bench coach was #30 for much of his playing career, and #12 when managing the Mets. #16 Jim Presley: The first new Oriole hitting coach since the 1990s had #17 and #18 during his playing days in Seattle, Atlanta, and San Diego. #23 Wayne Kirby: Gregarious first base coach sported #35 as an Indians outfielder in the 1990s. #25 Derrek Lee: Veteran first baseman has worn #25 and #27, but mostly the former. #27 Vladimir Guerrero: Same as it ever was for the powerful ex-Expo. How’s this for an odd coincidence? Four new Orioles (Hardy, Reynolds, Lee [w/ Atlanta], and Guerrero) all wore #27 last year. Mark Hendrickson, who pitched for the O’s in 2010 but starts this year at AAA Norfolk, also was in #27! #34 Jake Arrieta: Club’s No. 4 starter switches from #57. #37 Jeremy Accardo: New reliever had stints in #59 with the Giants and #49 with the Blue Jays. #41 Rick Adair: Makes the transition from Seattle’s pitching coach and #40 to Baltimore’s bullpen coach. #52 Mark Connor: “Goose” is the latest pitching coach, a role that he’s held under Buck with multiple clubs. As far as I know, he wore this number with the Rangers, too. #53 Zach Britton: O’s next great pitching prospect made an impressive debut today. If Matusz, Tillman, Bergesen, and Arrieta are any indication, Zach might switch to a lower number in the future. #59 Josh Rupe: Surprise choice at long reliever is used to high numbers. Wore these digits with the Rangers, and sported #65 with the Royals in 2010. #63 Kevin Gregg: Bespectacled closer has worn this number everywhere he’s pitched: Angels, Marlins, Cubs, Blue Jays. Does anyone know why? It’s not his birthday (6/20), or his height (6’6″). #77 John Russell: The third base coach gets the honor of the highest number on the staff. He wore #7 when managing the Pirates, but that number presumably remains out of circulation since the deaths of Cal Ripken, Sr. and Mark Belanger. Hope everyone enjoys visiting NumerOlogy early and often in 2011! It’s looking this season will be a lot more enjoyable than any in recent memory. 4/24/10 – Desperately seeking an offensive spark, the O’s shipped out infielder #6 Justin Turner and recalled first baseman #40 Rhyne Hughes from Norfolk. Rhyno did the trick for a few games before reality caught up to him. He’s the first infielder to wear that number for the Birds since Kiko Garcia. 4/27/10 – #31 Kam Mickolio‘s erratic stylings earned him a return engagement with the Tides. A year after Tommy John surgery, #55 Alfredo Simon came back to Baltimore and surprisingly assumed the closer’s role. He was last seen in #58. He’s 5-for-5 so far. 5/1/10 – #35 Brad Bergesen‘s demotion lasted for one start, as he came back at the expense of sent-down-and-injured reliever #43 Jim Johnson. “3E1N” has strung together three straight wins since his detour. 5/6/10 – #19 Koji Uehara finally made his debut in his new role as a late-inning reliever. Nice sideburns, by the way. 5/12/10 – Having battled his health and an apparent confidence crisis in his sophomore season, #14 Nolan Reimold became the latest addition to Norfolk’s roster. His replacement? None other than #6 Corey Patterson, who was last seen around these parts in 2007 in #17. On his second day back, he hit a home run to spark a five-run eighth-inning rally and then threw out the potential tying run at home plate to end the game. Things are getting weird in Birdland, and that might be a good sign. Yikes. 2-14 is not where you want your favorite team to be heading into a 12-game stretch against the Red Sox and Yankees, particularly when they’re missing multiple key players. Is the room spinning? Out: #18 Felix Pie (DL), #35 Brad Bergesen (demoted to AAA), #51 Mike Gonzalez (DL). In: #16 Lou Montanez, #31 Kam Mickolio, #53 Alberto Castillo. The three newest members of the team have been here many times before. Lou is working on his fourth stint in Baltimore over the past three seasons, and each time he has worn a different number. He debuted in 2008 with #3, then popped in about a year ago in #14, then came off an extended DL trip last September in #2, and here he is in #16. He joins pitcher Billy O’Dell and catcher Chris Hoiles as the only two Birds players to wear four different numbers. Mickolio has worn just one number with the O’s, but has done so in five separate swings through town over three seasons. Whew! Meanwhile, Castillo has also been pinballing between Norfolk and Baltimore since 2008, and is on his third different number, following #23 and #24. Since numbers are my thing here, let me just say that I hope the Orioles can start putting some crooked ones up on the scoreboard before I lose my mind. How soon we forget. Melvin Mora wore #6 for nearly ten seasons in Baltimore, longer than any player this side of Paul Blair. But one week into the first season post-MelMo, the Birds went and gave his old number to rookie infielder Justin Turner, who was called up from Norfolk yesterday to take the place of #1 Brian Roberts and his balky back. I hope Turner appreciates the gesture, considering that he was saddled with #83 when he debuted last September. Oh, and if you’re curious, Melvin is still wearing #6 in his new digs in Colorado. At long last, the games count. 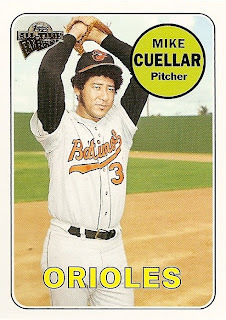 Before we get down to business, let’s take a moment to remember the first great #35 in Orioles history, Cuban offspeed specialist Mike Cuellar. He passed away last week after a brief battle with stomach cancer, and naturally he will be missed. You can read my expanded thoughts about “Crazy Horse” on my blog. Hopefully the O’s will honor him with a jersey patch or something similar. Opening Day just isn’t the same when it’s a Tuesday night game in Tampa’s underwhelming dome, especially when the O’s lose, but we’ll make do. Here are your 2010 Baltimore Orioles! There are six players and one coach making their Birdland debuts (denoted with an asterisk), and another five who have changed numbers (denoted with a carat). I’ve also made a parenthetical notation for returning players and coaches indicating how many seasons they’ve been with the team. There are no outlandish numbers on the active roster, though Clubhouse Character Will Ohman takes the usually unpopular #13. Needless to say, all the new guys and new numbers have been added to the all-time roster and bio pages, as well as the Odds and Ends where applicable. Now let’s play ball! Spring has sprung! The weather’s getting warmer, there’s baseball being played in Arizona and Florida…of course, from the results of the first one-third of the Grapefruit League schedule, it seems like the Orioles are still asleep. I’m sure they’re just waiting for me to post the Spring Training roster. Well, here it is! This is the third straight year that I’ve chronicled the Spring Training numbers, which I don’t include anywhere else on the site. I’ve included some of the 2009 numbers below where they differ from 2010, but you can see the full Grapefruit League rosters for previous years here and here. They come in useful when someone asks me a question like, “Didn’t Matt Wieters wear #58 before?”. #1 Brian Roberts – This marks a full decade in Birdland for Brob. #2 Lou Montanez – The odd man out in the outfield wore #12 last spring, but #14 and then #2 in the regular season. #3 Cesar Izturis – You’ll note that Izzy is not #2. I just hope Dave Trembley remembers that when filling out his lineups. #9 Miguel Tejada – Gee, wonder why he didn’t just take #10 back? With pitchers and catchers reporting next Wednesday, I figured that I’d better check in with an offseason update before the offseason is actually over! Besides, one of my readers has been nudging me to get in gear for a few months, reminding me how “depressing” it is to pull up the site and find Sean Henn‘s sad mug looking back at him. Naturally, there’s been a lot of player movement since last we met here. I’ve updated the all-time roster to reflect the players who are no longer with the organization. 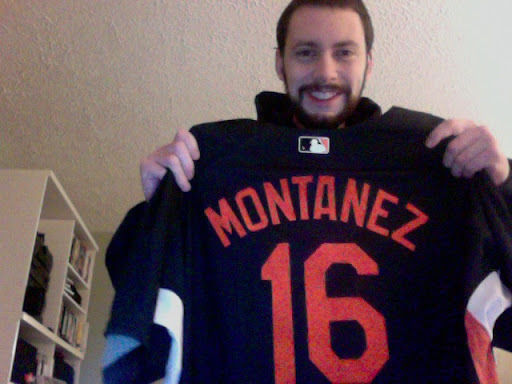 Obviously, the most notable is third baseman #6 Melvin Mora, who leaves Baltimore after a decade in orange and black. He’ll be playing multiple positions with the Rockies, who have not yet assigned him a number. #6 appears to be available, though. -Miguel Tejada, returning to Birdland as a free agent, is switching to #9. He wore #10 for the O’s between 2004-2007, but says that he had no attachment to it. Maybe he just didn’t want to pay for the Rolex that current #10 Adam Jones named as his price for the digits. This displaces previous #9 Michael Aubrey, who is now listed on the team roster as #24. -Blue-chip rookie pitcher Brian Matusz will switch from #52 to #17. The latter number, which belonged to then-O’s and now-Giants first baseman Aubrey Huff when Matusz arrived in August 2009, also happens to be the number of Brian’s favorite childhood player, ex-Cubs first baseman Mark Grace. -Worldwide sensation and second-year catcher Matt Wieters swaps #15 for #32. Wieters wore #32 at Georgia Tech and throughout the minor leagues, but it belonged to not-long-for-Baltimore reliever Jamie Walker at the time of Matt’s Oriole debut last May. If you spent good money on a #15 WIETERS jersey already, don’t fret. You can just tell people that you were in on the ground floor! -The O’s acquired veteran starter Kevin Millwood (pictured at top) from Texas for a package headed by struggling reliever #37 Chris Ray. Though the #33 that Kevin wore with the Rangers has been retired here for Eddie Murray, mlb.com lists Millwood as #34, which he previously wore in Atlanta, Philadelphia, and Cleveland. The incumbent #34 (Matt Albers) is listed as #37, for what it’s worth. -The new first baseman will be ex-Rockie Garrett Atkins, who may find his #27 occupied by returning reliever Mark Hendrickson. Again, consulting mlb.com, Atkins is listed in the now-vacant #25. -Former Pirates and Braves reliever Mike Gonzalez is expected to fill the closer’s role, and the #51 he’s worn throughout his big league career is available for the taking. -The only other new acquisition that is considered a “favorite” to make the roster is lefty bullpen arm Will Ohman, a seven-year major league veteran who accepted a minor-league deal with a spring training invite as he seeks to prove that he’s rebounded from an injury-plagued 2009 season. If Ohman makes the cut, two numbers that he’s worn in other stops should be free for him – #13 and #50. Well, I don’t want to bombard you with too much information after a four-month layoff, so I’ll pull up on the reins here and check back in after camp opens in Sarasota next week. Until then, have fun and stay off the roads if you’re in the path of Snowpocalypse 2010! I started a new job in September, and the Orioles’ customary late-season snooze didn’t do much to spur me to update the site, but I guess that’s the occupational hazard of the O’s fan/blogger. Still, there are roster moves to belatedly report. September 8: #10 Adam Jones was placed on the disabled list with a sprained ankle. The second wave of expanded-roster callups included pitchers #55 Chris Lambert, #41 Bob McCrory, and #29 Chris Waters. McCrory and Waters had been in Baltimore before, but Lambert was a first-time Oriole and the tenth player to wear double-fives. Two other new Birds made team history by becoming the first to wear their respective numbers in a regular season game: catcher #78 Guillermo Rodriguez and infielder #83 Justin Turner. These are exciting times, huh? The O’s used their extra coaching slot in September to call up Norfolk pitching coach Mike Griffin, who had worn #42 as a pitcher for the club in 1987. This time around, he broke in the #91 jersey. September 9: Deciding that they were just one marginal reliever away from perfection, the Birds added #53 Sean Henn (pictured) in a trade with the Twins. Henn had been with Minnesota’s AAA club in Rochester, whose season had already concluded. He was shocked to get the call at his Dallas home ordering him to fly to Boston to meet his new teammates! Sean became the tenth Oriole to wear Arthur Rhodes‘ old number. September 19: Having lost another outfielder (#14 Nolan Reimold) to the disabled list, the club did an about-face and reinstated #2 Lou Montanez from the DL. #31 Kam Mickolio was also shut down in mid-September, but the team mercifully did not replace him with yet another relief arm. This finally brings the 2009 season and its manifold roster moves to a close. According to the relentless Roch Kubatko, Baltimore used 48 players in these 162 games (27 pitchers, four catchers, nine infielders, eight outfielders). There were 23 first-time Birds, nine of whom made their MLB debuts. The all-time tally of O’s players stands at 871 (counting only those who have played in games). Pity the clubhouse attendant! So what does 2010 hold? There’s already been word that rookie phenom #52 Brian Matusz wishes to switch to #17, the number worn by his favorite player, former Cubs first baseman Mark Grace. Until the Hot Stove Season starts, let’s all take some time to decompress…and root against the Yankees, if you’re so inclined. I know that I am. Another September has arrived with the Orioles buried deep in the cellar of the American League East. But this month also brings the potential for expanded rosters, which makes it a time of interest as it pertains to this site. The O’s have already called up four players from AAA Norfolk, three of whom have been here before in ’09: relievers #24 Alberto Castillo, #34 Matt Albers, and #45 Dennis Sarfate. The fourth player has not been seen in Baltimore since 2006. Outfielder Jeff Fiorentino, affectionately known as “Screech” for his resemblance to the nerdy character from “Saved by the Bell”, had worn #16 in previous cups of coffee in 2005 and 2006. However, he has now made history as the first Oriole player to ever wear #70 in the regular season, which he did in replacing Adam Jones during Tuesday night’s loss to the Yankees. Wild stuff. A little bit of news on the coaching staff, as John Shelby left the team over the weekend due to a death in the family. Minor league instructor Don Werner filled in for him (wearing #58) and will stay with the club until next Tuesday, when minor league pitching coach Mike Griffin will take his place. (All teams are allowed to carry an extra coach this month as well.) The O’s are also expected to add a few more players that day, including an infielder (likely Justin Turner), a catcher, and probably twenty or thirty pitchers. So I’ll be back next week with more updates, and I bet you can’t wait. I think we can safely say that the Orioles have just become the first team in baseball history to replace Aubrey with Aubrey. 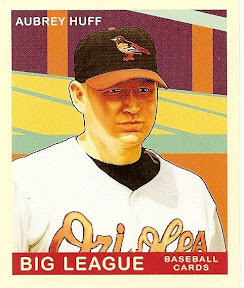 Monday, the Birds traded #17 Aubrey Huff to the Tigers for minor-league pitcher Brett Jacobson. To fill Huff’s roster spot, they recalled first baseman #9 Michael Aubrey from AAA Norfolk. Michael becomes the 26th Oriole to wear the number, and the 19th player to make his O’s debut in 2009 (per Roch Kubatko). Of course, #9 was available because Baltimore traded Gregg Zaun to the Tampa Bay Rays on Friday 8/7 for minor-league first baseman John “Rhyne” Hughes. That paved the way for #16 Chad Moeller to return from Norfolk and reclaim his place as backup catcher. Easy come, easy go. One more move from yesterday, as the two most frequently up-and-down members of the roster passed one another in the night. #34 Matt Albers is back to Norfolk for the third time in ’09, and #31 Kam Mickolio takes his place in the bullpen and on the roster. Kam is in his third stint on the Birds’ roster this season and fifth overall. Both ends of this transaction were well-deserved. What can you say about the team’s play since the All Star Break? Nothing that doesn’t give me a headache. They’re spoilers – in the sense that they’re doing their best to spoil my summer. C’mon, 2010.